On the high hills of the right bank of the Dnepr River magnificent Kievo-Pecherskaya Lavra topped with gilded domes is situated. According to the legend, Apostle Andrew, while preaching the Word of God in the Scythian Land, blessed the hilly bank of the Dnepr River and said to his disciples: «On these hills great city and many churches in glorification of Holy God will be». The history of Kievo-Pecherskaya Lavra started in remote days and is closely connected to the Far and Near Caves. According to historical chronicles, in 1051 Reverend Anthony settled in one of the Varangian caves that is a part of the Far Caves nowadays. This year is recognized as the foundation date of Kievo-Pecherskiy monastery («pechera» means «cave»). Those who knew Anthony visited him in the cave and brought some food and necessary things. Some of his followers settled in the cave with him. Soon the number of Anthony's associates reached 12, and they started to build cells and temple in the cave. Many people wanted to visit Anthony. Among them were even Kiev princes and nobility who donated money for constructing over groundtemple and monastery for the growing brotherhood of monks. As of Reverend Anthony, he was anxious for seclusion, so in 1057 he left the Far Cave and went to another slope, where he dug one more underground cell, which is now is known as the Near Caves. He spent 40 years there. Soon after the overground monastery was built and the monks moved there, the caves were used as a burial place for the members of brotherhood. Reverend Anthony was the first one to be buried in the Near Caves in 1073. The caves were used as a burial place for more than 700 years. An important event in the history of Kievo-Pecherskaya Lavra was foundation and construction of the Assumption Cathedral. It took 15 years to build the cathedral. Greek and Russian architects and icon-painters participated in the process of the cathedral construction. Venerable Alypios, the one who is considered to be the founder of special way of icon painting, which was different from Greek one, also took part in the Assumption Cathedral decoration. Kievo-Pecherskaya Lavra is closely connected with Russian chronicles. The first chronicler was Venerable Nikon, Father Superior of the Pechersky Monastery. He finished his great «The Russian Primary Chronicle» about 1113. Another unique work of literature, Kiev-Pechersk Paterikon, was written in the monastery in the 13 century. The Pechersk Monastery was an important spiritual, social, cultural and educational center. It played an important part in the unification of Eastern Slavonic Lands. The monastery was honored in Poland, Armenia, Byzantine, Bulgaria and other countries. Gradually Kievo-Pecherskaya Lavra became the largest monastery on the territory of Russia: its' total area reached 30 hectares (1 hectare is 10,000 square meters). On the lands of lavra there were about 100 constructions, 42 of which were considered to be unique. On the territory of lavra 23 temples were erected, including 6 cave temples, with 36 altars. More than 150 saint hermits came from lavra, and remains of many monks, preachers and ascetics are buried in the caves of lavra. During the October Revolution of 1917 the property of lavra was nationalized, many monks were shot, imprisoned or exiled. In the years of the World War II the buildings of lavra were badly damaged. Kievo-Pecherskaya Lavra survived and went through all the troubles. In June 1988 in commemoration of the 1,000 anniversary of Kievan Rus Baptism the territory of the Far Caves and all the monastery buildings were transferred to the possession of the newly created Pechersk community. Kievo-Pecherskaya Lavra still remains the sacred place and the center of pilgrimage of Orthodox Christians from all over the world. 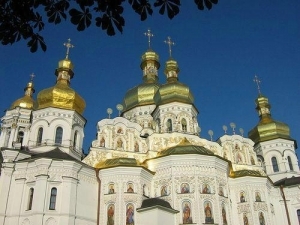 Thanks to Kievo-Pecherskaya Lavra, Kiev is known as the «Russian Jerusalem».